Overlay is another surface decoration technique which uses soldering. The process involves the creation of a least two pieces of art, the base piece and the actual overlay decoration that is soldered to the base. 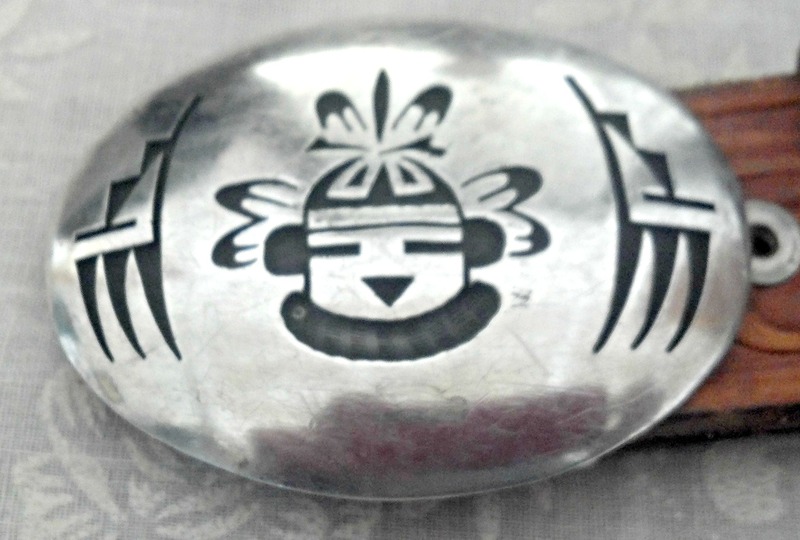 Overlay is commonly used in traditional Southwestern Indian jewelry, but the process of creating layers of sheet metal on top of each other as decoration has been used for a long time. Prior to the development of modern torches, soldering was a fairly difficult process, involving the use of a blowpipe and a fuel source, or a kiln (oven). Most ancient soldering and fusing was only done on fine silver and high karat gold. The ability to have specially formulated solders that melt at different, and very specific temperatures, is a modern luxury. Ancient peoples understood how to make solder melt at a lower temperature but the precision with which our modern solders can be formulated is amazing. This graphic shows the basic idea of how a piece of overlay is soldered together. The top and bottom layers of metal must meet very closely so that the solder will naturally flow between them and form a solid bond. The entire piece must be heated enough to have this bond extend completely under the top layer of metal. Take a look at this picture of a silver belt buckle. The surface of this piece actually started out as two separate layers of metal. The top layer had the design transferred to it, and then that design was carefully cut out with a jeweler’s saw. The edges were carefully finished with a file and sand paper. The areas that show as black in the photo are actually the bottom layer of the buckle. If you look carefully and trace out the design lines you can see that a significant portion of the top layer is in one piece, but not all of it. The main portion of the top layer would have been soldered to the bottom layer first, and then any separate pieces would have been added later and soldered in place, using a lower temperature solder. The most difficult things about doing this type of soldering is making sure that the surfaces of the two pieces of metal meet perfectly, and that all portions of the top layer are completely soldered to the bottom layer, while not getting too much solder into the areas that are not covered by the top layer. All excess solder has to be removed without damaging the design or the areas around it. In the case of most Southwestern Jewelry, once the top layer has been completely soldered in place and any excess solder has been removed, the areas of the bottom layer that show can be treated with a chemical, like liver of sulfur, to turn it black. This blackening of the bottom layer creates contrast that makes it easier to see the design that is created by the top layer of metal. This use of oxidation to create contrast is used with many different types of metal work. I hope that this brief article gives you a better understanding of the process of overlay decoration on jewelry.